Best: D.Beasy (BOG), R.Robertson, K.Hands, J.James, J.Cheffers, L.Kerr. Reports: Nil Injuries: P.Webster (bruised thigh) replaced by K.Warburton at three-quarter time. B.Milroy (stomach cramps) replaced by B.Molony fourth quarter. 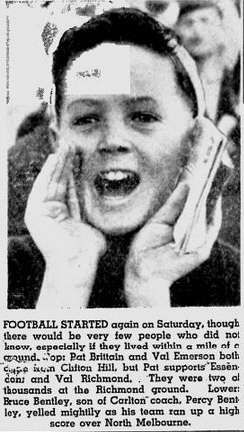 Carlton got off to a great start in Season 1955 with a huge win over tha Kangaroos at home. This 69 point win was off the back of a mammoth 9 goal last quarter which blew the Roos away. Despite the huge win, Carlton were second on the ladder after Round 1 on percentage from Footscray. "Carlton outclassed North Melbourne with a dazzling display of lightning-fast, heady football which would have done justice to a premiership prospect in mid season." The Blues played non-stop classy football from the first bounce. The centre line was on top and provided a lot of drive into attack which the forward line used to full advantage. "Two factors gave us the win - the workmanlike way the boys went about the game, and our condition, which was outstanding for this time of the season. When they went on with it in the last, I said something I've been wanting to say a long time: "This is our year." Highest winning margin (69 points) against North Melbourne since 1931. Best score against North Melbourne since 1942. Contributors to this page: blueycarlton , pblue , Bombasheldon , molsey , Jarusa , WillowBlue , camelboy and admin . Page last modified on Tuesday 19 of March, 2019 10:34:34 AEDT by blueycarlton. 1998 - Bradley to put best foot forward (15/04/98). Swan Districts 1983 Premiers - Future Blues; B.Shine, M.Smith, P.Kenny & P.Sartori.